The tooth has fully “erupted,” meaning it’s come through the gums and can clearly be seen in the mouth. The tooth can be easily grasped with forceps so it can be removed “cleanly” and in one piece. Since an incision doesn’t need to be made, stitches aren’t necessary. 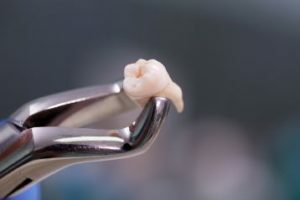 Many people associate a “surgery” with a major procedure at a hospital that requires general anesthesia, but in this case, it simply means that a small incision must be made to access a tooth. Since an incision is necessary, stitches are done to allow the gum tissue to heal. The tooth has broken off at the gumline and can’t easily be grasped with forceps. The tooth hasn’t erupted at all or has only partially erupted through the gums. When the root of the tooth has broken into small pieces. In some cases, the bone tissue around the tooth or even the tooth itself may need to be cut into smaller portions to be removed. Regardless of which type of extraction you need, your dentist in Richardson will start by making sure that you’re completely numb and comfortable – from start to finish. Remember, your dentist gets extensive training for many years to provide the dental care you need as comfortably as possible. And, although extractions are a last resort, they lead to better oral health and a healthier smile in the long-term – which everyone can agree is a good thing! Dr. Adrian De Vincenzo is a general, cosmetic and restorative dentist in Richardson who has years of experience, advanced training, and a reassuring chairside manner. During more involved procedures like tooth extractions, he’s always able to put his patients at ease and provide a great dental experience. If you have any additional questions, he can be contacted via his website or at (972) 644-3800.